SEGA’s hotly anticipated Yakuza 0 released last week in Japan amidst the current blow out of Playstation 4 titles bonanza that started off with Dragon Quest Heroes a couple of weeks back. With the previous spinoff title Ryu Ga Gotoku: Ishin being able to move only 400,000 or so units, in line for spinoffs, it was always interesting to see how Yakuza 0 was going to perform. 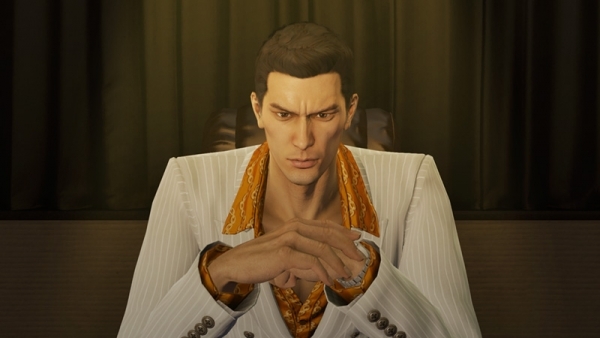 Would it fall in line with a spinoff, after all the gameplay system and technically story haven’t moved forward, or would this defy the odds and perform closer to a true mainline Yakuza game? Hit the break to find out how SEGA’s latest installment in the Yakuza series performed. The good news for SEGA is that the game did perform better than Ryu Ga Gotoku: Ishin, the bad news is the increase is marginal at best. First week sales for Ishin was 138,158 for the Playstation 3 and 82,540 for the Playstation 4. With total sales of 236,329, Yakuza 0 is just ahead of Ishin (220,698) by 15,000 units and although it’s stayed a good healthy distance ahead of Kenzan! one has to wonder why Yakuza 0 wasn’t able to perform as well as Yakuza: Of the End which debuted of sales of just over 300,000 units. There are several reasons, some positive, whilst others negative so let’s get that out of the way. For a series that has long held a strong and stable user base, perhaps franchise fatigue is finally catching up to the series. Whilst SEGA has tried to limit this as much as possible by producing fun side projects in between, it could be the fans are finally starting to get tried of the franchise. The second negative reason could be far worse for the future of this series and other core experience and that is mobile has finally starting to take a large chuck of the traditional Yakuza fan base. It’s no secret that mobile games are big in Japan, in fact, it’s actually bigger than the traditional gaming market AND that’s including hardware sales on the console side. Mobile games in terms of software generate $5.1 billion in revenue with game software revenue being just $2.8 billion. The more positive reasoning could simply be because fans want the series to progress forward, not backwards. Yakuza 5‘s storyline meant there was still scope to push the narrative of the series forward whilst it’s no secret the gameplay has been restrictive recently. Yakuza 5 introduced five protagonists whilst the followup games only feature one and two playable characters. The content as well has been pretty slim, Yakuza 5‘s 5 cities and an explosion of new minigames, from Haruka’s dance gameplay to Kazuma’s crazy taxi races. If this is the reason than there’s not much to worry about. I however feel the answer lies in the middle, even if Yakuza 6 is a big improvement in terms of storyline and gameplay, I still feel that we will see another reduction in the user base of the series like we saw in the transition from Yakuza [PS2] > Yakuza [PS3] and it has more to do with the shifting landscape in Japan than the series overall reception. That wraps up this week’s analysis, hope you all enjoyed the read but hopefully I can bring some better news next week, until then! The 15k increase over Ishin is most likely due to the install base then versus now. I personally think the fatigue is real, I wonder how SEGA will tackle this? Next RGG won’t come out next year and be radically different? I’m not sure myself, I’m not confident in the Japanese console market personally. The Playstation 4 is selling worse than the Playstation 3, the Wii U is selling worse than the Wii, the Xbox One is selling worse than the Xbox 360, the Nintendo 3DS is selling worse than the 3DS and the Vita is selling worse than the Playsation Portable. The market contraction is real and I don’t think even a radically different Yakuza game is going to change that. And even IF it is radically different, does SEGA want to put that kind of investment into a market that is moving closer and closer to mobile/handheld offerings than consoles? Very much doubt it unless they can open up a new form of revenue for the series IE Western sales. I think a Yakuza mobile app is more likely than a different approach to the series. They risk to kill the series if they continue with “Japan-only” and to recycle the same old PS2 formula. The legs of the franchise, are not to be underestimated…the other half a million of Yakuza 5 were made afterwards. The challenge for the franchise is to break even, stay profitable…honestly I’m surprised SEGA was able to expand the series the way they did back in the PS3 era, despite the PS3 being so expensive and with a userbase much smaller than PS2. For that reason, I think they will manage. Sega really tough, HAS to be embrace the west for PS4/Xbone and even PC Online gaming (PSO2). I agree with this, the series can continue to sell well. My biggest worry is that console sales continue to drop and drop and drop. No one is picking up a Wii U, a PS4, a Xbox One… The “best” sales the PS4 has seen since launch have been 50,000 units… Which is still pretty bad. The console demograph seem to have moved on which could be bad news for Japanese centric series like Tales and Yakuza. It definitely could, but I’m not sure if they actually can? Depends if Sony funds the games or not. But since Yakuza 1/2 appeared on Wii U, SEGA should try porting those two on PC and see how they perform. 1st week sales aren’t that impressive but considering it’s only been out a week, it might either rise in the next few weeks are stay steady and continue to shift units at a steady pace. I don’t think it has to do with the shifting landscape as much as franchise fatigue. Enough with the yearly Yakuza games, Sega. I think not just Yakuza, but any series that are console centric in Japan don’t have much life left. Unless Yakuza 5 is able to somehow herald a unlikely new era of Western sales, it’ll be another series that will either be forced to go mobile or be retired by SEGA whilst the team try to establish a new series that should take a global approach in terms of marketing. Personally I’m not sure why they didn’t continue with the GREE Yakuza title, Seemed great and was fairly popular. Truthfully, consoles don’t have much time left in Japan. Sales in the Japanese market has been the lowest since 1991, that should underline how dire the situation has become. Pretty much no chance of their ever being a Sega console again then, they say never say never, but realistically, it seems Sega got out at the right time, if at least one generation early, just as mobiles were starting to take over market share. If the traditional home videogame consoles have had their day now, videogame companies existing as hardware producers then are only going to be realistic if they move into mobiles and tablet systems themselves, like what Apples done with their exclusive ios range. Japanese market is not the reason why Yakuza sales are low. It’s just japanese people are getting bored of the same old game released on yearly basis. Yakuza needs a real next gen game and to trash its old PS2 engine, and Sega needs new AAA IPs too, or they will be forced outside console market real soon, and I don’t want to see Sega becoming a crappy mobile company. Care to explain why the market is the lowest since 1991 then? Why all the console makers are seeing lower sales than their predecessors? Why we have even less million sellers than we did a decade ago? Looks like even Konami is bailing out of console development in Japan, key staff members for Love Plus and Tokimeki Memorial have left, Kojima stepping down as an executive. SEGA does not need AAA IPs, SEGA needs good selling IPs. AAA is the death of creativity and restriction in developer’s visions. Luckily SEGA has plenty of good selling international IPs, complimented nicely with extra sources of revenue via animation, toys and mobile games. Don’t try the japanese market crisis card to excuse all the crap Sega did in the console market. Yakuza is selling poorly because it’s another mismanaged franchise like 99% of Sega’s IP, not because japanese console market is finished. You should explain this, if japanese console market is finished, why many japanese developers are starting to increase their console presence in the coming years? It’s just Sega that is finished. You’re not exactly backing this up with facts, just what you believe is occurring as to what is actually happening. Here is a few major developments that have occurred this week that greatly affects the Japanese console market. Please back up your facts, who are these MAJOR console development teams you speak of? Nintendo is moving resources away into mobile, SEGA, Konami and Capcom have drastically cut down on console IPs, Square likewise. You pick a few minor cases (Without backing it up) but no proof. Japanese development on console isn’t on a rise but decline, there are great cases of them moving to PC and recognizing the platform but Japanese exclusive console franchises? No those are finished. And how isn’t the Japanese console market finished? Lowest sales since 1991, Xbox One selling worse than the Xbox 360, Playstation 4 selling worse than the Playstation 3, Wii U selling worse than the Wii, 3DS selling worse than the DS and Vita worse than the PSP. How doesn’t this alarm you or paint a negative picture for the future of console development? SEGA is far from finished, you seem to only look at console sales and that’s the whole market, it isn’t, it is but another area. And this is just one example of japanese companies who are increasing their console output. Square Enix just announced a new AAA rpg coming. Nintendo is the worst example you could make, they’re not shifting any resources away from console, on the contrary, together with the smartphone deal, they announced the new console NX, A NEW CONSOLE. Sega is finished, they abandoned arcade and consoles to follow the success of shovelware like Chain Chronicles etc.. they don’t have any plan for next generation ,they don’t have any plan arcades, no new games etc. Who cares if the pachinko is doing good, if PC is doing good, if mobile is doing good, that is not even the real Sega. If from now on the games relased will be only Total War on PC, the crappy Sonic Runners on Ios and that ugly Project Diva clone (Magical girls whatever) on console, then they’re already dead. That’s but one example and does not offset the growing trend of Japanese developers making strides into mobile gaming, tri-Ace, Mistwalker, these are part a few. The big ones like Capcom, SEGA, Konami have already set their sights on more mobile and PC development. You can’t use one example and then be done with it. Kojima’s name is being wiped out of Metal Gear sites, all of them, his production team too. He might not leave but signs clearly indicate Konami is refocusing their attention to less console games. Square Enix DID NOT say a AAA franchise, they said a console title. This could very well be another Dragon Quest Heroes type game, we have to wait and see. 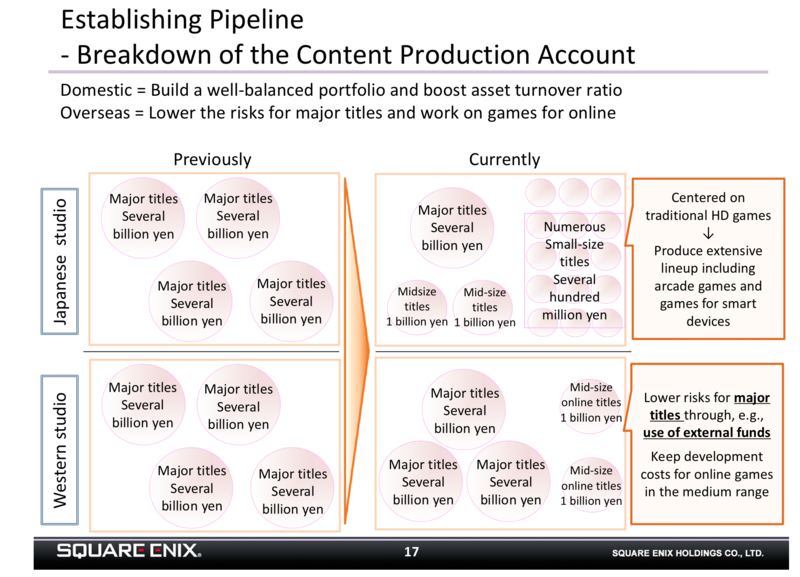 Furthermore, this is Square Enix’s future plans from late 2014 http://i.imgur.com/dFMMKZx.png as you can see, several AAA titles have been shafted in return for both mid-budget titles and many mobile titles. So that’s another developer who is decreasing investment into AAA production. Nintendo always had a new console in the plans. That doesn’t mean resources aren’t being shifted, they’ve spent money to purchase 10% of DeNA, which isn’t exactly a small company. They will make console games but now will use funds to make a mobile game. Will staff from Nintendo make them? We don’t know yet, but it’s obvious Nintendo is going to use monetary funds to create mobile games. That’s using resources wither you like to admit it or not. The Xbox One has been out in Japan since last year, where are you even getting your facts? And please, do you think one IP is going to save console gaming in Japan? Do you think one title is going to force old users who have abandoned consoles to come back? Highly unlikely. We’ve had Dragon Quest Heroes, Yakuza 0 and soon Bloodborn yet the PS4 is just managing 30,000 units. By the time Final Fantasy XV or MGSV would have hit, expect the market to have contracted further. Japan’s console market is finished. Of course like I said it’s not just the cyberconnect, for example there was a list on famitsu or dengeki at the beginning of the year, with many developers plan for 2015, and guess what, many developers, even one like Granzella who made only Plasyation Home items, had console plans. Why returning on consoles if the market is finished? Because all developers are wise enough to see that a new generation and the worldwide approach in mind bring opportunities, something that Sega still doesn’t get. Kojima thing is still a rumor, and Konami refocusing the attention away from console is just your speculation. As for Square, if it’s not a AAA it will still be an AA title, why announcing a new jprg for consoles (not your typical cheap game) while they still have to release FFXV if the console market is finished? For Nintendo, shifting resources means taking resources away from where they are and take them elsewhere. Sega is shifting resources, taking arcade and console budget and giving them to PC and mobile development. Nintendo is NOT shifting resources, console development will still have the same budget if not more with the arrival of the new console. For Xbox, wake up, mine was just sarcasm (read inside brackets next time). In the end, Sega abandoning console is just another of the many big mistakes that made the once leader of the arcade and consoles market, an irrelevant company, even if their dear mobile market. Yakuza will soon be another victim of Sega stupidity if they don’t change approach. You’re only using one or two examples to base your entire outlook. This is frankly silly as the big developers, Capcom, SEGA, Konami and Namco are focusing more on diversifying their portfolio than staying solely on consoles. You seem to be mixing up the global console market for the Japanese console market. I have made it absolutely clear I am talking solely about Japan. Please stick to the point. Nintendo is using funds to produce and release mobile titles. Wither you like it, this funds could have been allocated for game development, now it would be used for mobile gaming. You cannot deny this, I could use the same reasoning and outline how just one specific instance, such as SEGA continuing the Sonic series, means funds aren’t being redistributed. This of course is wrong because like Nintendo, SEGA has many other projects on the side that are effected. So too shall Nintendo. Why don’t you start acting a bit smarter instead of hand waving things away, you’re just planting your head in the sand and saying nothing is changing when everything is. Finally SEGA abandoning the console market? Is this why Alien is probably getting a sequel? Why Sonic is getting more console games? Why we’re probably going to have more dance rhythm games? Why they invested in Atlus, you clearly are only looking at what you want to see and now what is actually occurring. You don’t even know the market condition, you haven’t even given a good reason why the Japanese industry is the same size now as it was in the 1991. That means a totally collapse in the industry. And as I have pointed out, Yakuza’s dropoff is a combination of things, unable to progress the story from the cliffhanger ending in Yakuza 5, franchise fatigue, smaller in scale and the market conditions in the Japanese home console market. I never said that big companies aren’t looking at the mobile market, what I said is that only Sega is abandoning the console market for some lukewarm success they had on mobile, other companies are wise enought to fully support both console and mobile market at the same time. For Kojima, the only thing confirmed NOW (not at the time of your previous post) is that Konami is searching for staff for the next Metal Gear console games, the rest are just your speculation. Konami is restructuring, but they don’t say anything about refocusing on mobile, even in your link, so it’s just your speculations. For Nintendo, that is a simple concept, Nintendo is adding funds to mobile development, they are not shifting the resources away from consoles and handhelds, on the opposite with the launch of NX they will only increase their console output, that’s the big difference with Sega that sacrificed arcade and console output in favour of mobile and pc market. As for japanese industry, you haven’t given any reasons about japanese market reduction too, you are just interested in validate your theory about japanese console market finished so you can say that Sega is doing good by focusing on mobile. if your read that correctly, you would see that the thing that are reduced are software sales, not the hardware sales, that apart 2006-2007 (PS2-Wii), remained fairly constant since 1997, so what are you taking about? It’ll be bad if this is the start of decline for this IP, as this is probably the most expensive IP Sega has, and is the closest we have to Shenmue, if this goes down because Sega can’t market it properly or/by constantly restricting it to Japanese territory only, the chances of this being seen as viable IP are slim, and Sega already has enough dormant IPs as it is, if only Sega looked after it’s IP like Nintendo does with theirs, look at Nintendo IP, even the more obscure of Nintendo gets some satisfactory degree of recognition.